On Wednesday, demolition continued at the Christian Street Baptist Church in Bella Vista. Developer Ori Feibush is razing the property. A new developer will build townhouses. After more than a year of controversy surrounding the fate of Christian Street Baptist Church in Bella Vista, the century-old building is coming down. The cupola atop the building had been dismantled by Monday afternoon, and workers continued to chip away at more of the building Wednesday. Last week, neighbors who live in the fast-gentrifying neighborhood said they had seen windows being removed. A large pink dumpster sat outside throughout the week. 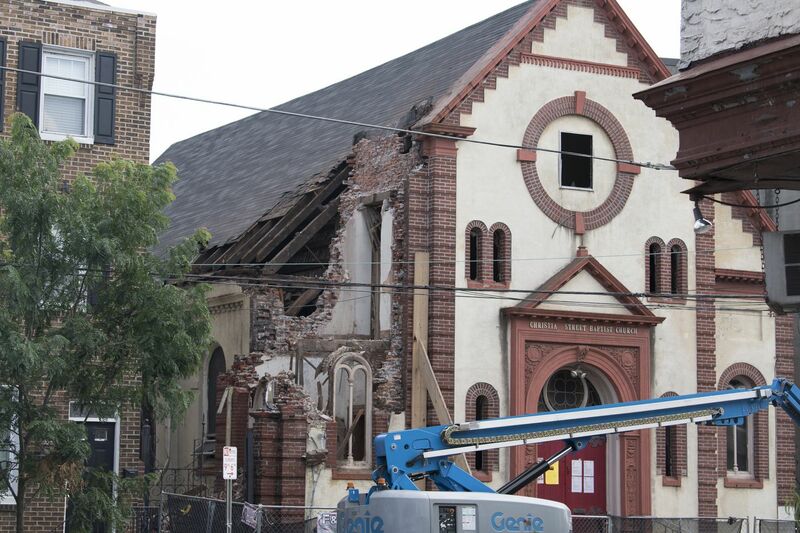 The start to the demolition, which came after a week of asbestos remediation, is part of a complicated and dramatic story that has enveloped the small church and Philadelphia's development community throughout the last year. Last summer, South Philadelphia developer Ori Feibush entered into a $1.5 million purchase agreement for the property at 1024 Christian St., with a plan to demolish the church and build six $800,000 townhouses in its place. Demolition began earlier in the week and continued Wednesday. Developer Ori Feibush declined to comment on when the demolition might be complete. The situation grew complicated, however, when the church was nominated for historic designation around the same time that Feibush made an offer. Oscar Beisert, a preservation activist in Philadelphia, made the bid to save the 1890s structure last June 8, citing its ties to Italian immigrants who once filled the neighborhood. After an emotional debate before the Philadelphia Historical Commission, the building was designated as historic. Then, following a misunderstanding of the commission's voting rules, it was not. Yet Feibush continued to face blowback for his decision to demolish the property. So, in April, he offered to chip in $500,000 and transfer his agreement of sale to a preservation-minded buyer should one step forward. 1024 Christian Street, the Christian Street Baptist church, in Bella Vista, last fall. Last month, Feibush said that he and the congregation had waited long enough and that his project would move forward. Then, developers Guy Laren and Stephen Wagner raised their hands, offering to buy the church and convert it into apartments. Feibush declined the offer, arguing that it contained a zoning contingency that could have delayed the settlement date by weeks. In addition, according to comments Feibush posted on Facebook, he was opposed to giving $500,000 to Laren, who secured a permit this year to tear down Christ Memorial Reformed Episcopal Church in West Philadelphia. On June 16, Feibush said he would demolish the property and walk away from it, transferring his agreement of sale to another developer. In correspondence with neighbors and stakeholders last month, Feibush said the new developer's plans are identical to his — six townhouses. The new developer has not been publicly named, and the deal has not been settled. Workers prepared the Christian Street Baptist Church for demolition on Tuesday. Feibush declined to comment Monday. It remains unclear how much trouble the new developer might face. Dozens of neighbors and other stakeholders remain upset over Feibush's decision to demolish the property. And the zoning approval path may not be so straightforward. The lot may not be big enough to support six townhouses under its current residential zoning designation — possibly requiring a variance. A subdivision could be created to accomplish the townhouse plan, but a variance would also likely be needed. In the weeks leading up to the church's demolition, preservationists and residents pleaded with city officials to save the church. Among those they asked: Mayor Kenney, who on the campaign trail vowed to enhance Philadelphia's preservation efforts. Asked last month about his position, Kenney's office replied in a statement: "The city learned that Mr. Feibush has a signed agreement with another party. The city is not inclined to intervene in a sales agreement between two private parties."